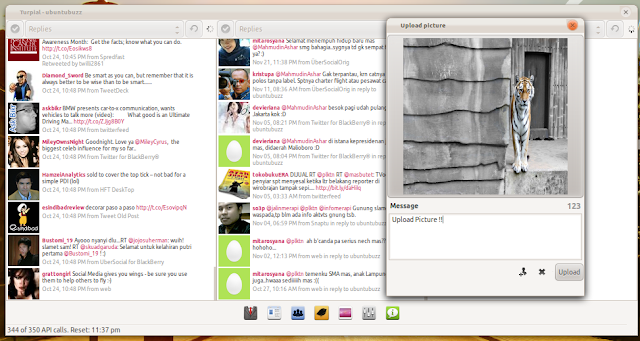 Turpial is Open Source twitter client application writes with python, though my opinion turpial is the best twitter client application ever which run in Ubuntu compared with Choqok, qtwit even gwibber. Turpial have good a appearance (some point having good icons), performance (you have a lot of setting inside), and User Friendly GUI that make us quickly to understand some function that available. 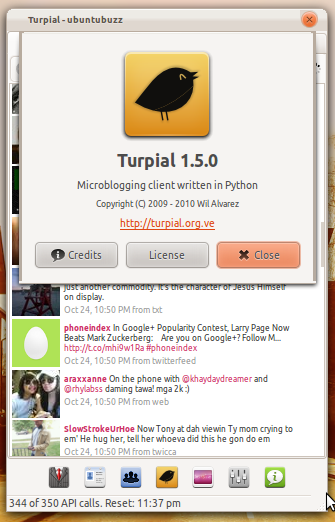 What features inside turpial 1.5 ? Turpial support single column view and multicolumn view (if you are using Multicolumn view it's look like tweetdeck). Colored tweets according to their status (yellow when read. blue when unread, etc). Besides of twitter, tupial has Support with Identi.ca. Enhanced Notifications (with further options). Customizable image hosting place for uploaded images. Customizable preferred service for shorten url service. To get more information about Turpial, you can visit its official website in turpial.org.ve writes in Spanish.